It is a beloved green oasis in one of the world’s largest concrete jungles. 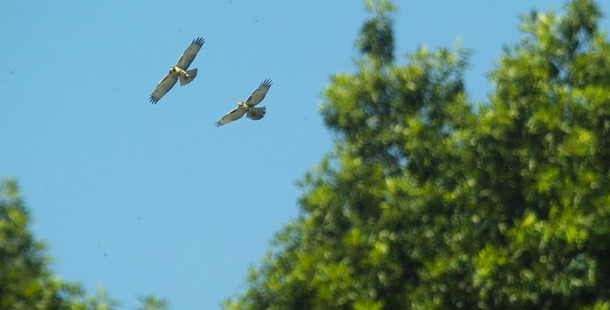 But New York City’s Central Park — where the red-tailed hawk that stars in NATURE’s Pale Male makes his home — isn’t just any city park: It is considered the crown jewel of one of America’s most influential landscape architects, Frederick Law Olmstead. Olmstead was born in Hartford, Connecticut, in 1822 to an affluent family. At 18, he moved to New York to work, first as a “scientific farmer” and later as everything from a seaman to a journalist. In 1857, political connections helped Olmstead land a job as superintendent of Central Park, a huge swath of land that the city had recently purchased for nearly $5 million. Some elite New Yorkers had championed the purchase as a way to show that the city was ready to compete with the likes of Paris and London. Others argued it would help keep workers “out of the saloon” on their day off. Olmstead teamed with Calvert Vaux, a landscape architect, to develop the “Greensward Plan” for developing the 843-acre park, which won out over more than 30 other competitors. It called for converting the rocky, hilly, and swampy parcel into a kind of pastoral Eden, complete with lakes, trails, and lush plantings. Ultimately it took 20 years and $10 million to complete the job, which included hauling in more than 10 million cartloads of dirt and fill, planting more than 4 million plants and trees, and building 36 bridges and 4 lakes. Central Park took 20 years to complete. After fighting seemingly endless political battles over park management, Olmstead left in 1877 and went on to design other major public spaces such as the campus of Stanford University and the grounds of the U.S. Capitol. He died in 1902. Vaux stayed with the park until his death in 1895. Since its completion, Central Park has undergone several cycles of neglect, decline, renewal, and revision. Olmstead, for instance, didn’t include fields for sports in his plan; those were added in the 1930s. Most recently, in the 1980s, park advocates mounted a major fundraising and rehabilitation effort, fixing lawns, walls, and trails. Today, the park — once used mostly by the wealthy — draws millions of visitors from all backgrounds. It has also become an urban wildlife magnet. Birdwatchers delight in spotting migrating warblers in spring, and identifying the ducks that visit its lakes. Raccoons and even foxes prowl its grounds. But no wild inhabitant has captured the attention of city dwellers like Pale Male, the young red-tailed hawk that showed up in the early 1990s, and started nesting on a building across from the park. 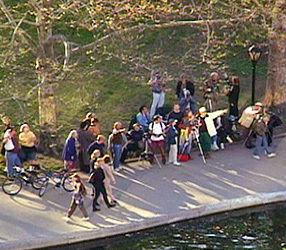 Hawk watchers showed up daily to watch Pale Male, and celebrate the arrival and first flight of chicks. They also observe the drama of the sharp-beaked predator prowling his Central Park hunting grounds for squirrels and pigeons. It’s a sight that would likely make Olmstead, who aimed to bring a bit of country into the city, very proud.